Ingredients: Cream Cheese (Pasteurized Milk and Cream, Cheese Culture, Salt, Carob Bean Gum, Guar Gum), Sugar, Sour Cream (Cultured Nonfat Milk and Cream, Cornstarch, Whey, Guar Gum, Carrageenan, Carob Bean Gum, Enzymes), Chocolate Chips (Sugar, Chocolate Liquor, Cocoa Butter, Butterfat, Vanilla, Soy Lecithin and Salt), Egg, Wheat Flour, Butter (Cream, Salt), Modified Corn Starch, Cocoa (Processed with Alkali), Egg Whites, Salt. To me, the Chocolate Chip cheesecake from Eli's is the ultimate dessert. 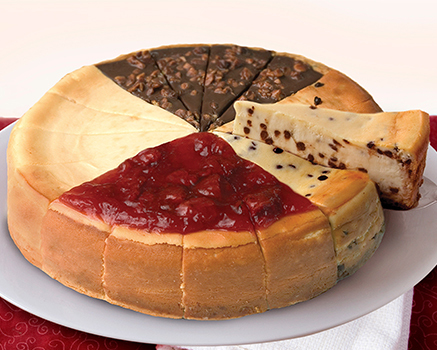 Your chocolate chip cheesecake is to die for. I sold your cheesecake at festivals in Chicago years ago.